The Kintyre Forum • View topic - Where is it world..
Have this pic on the camera..
Re: Where is it world..
Is it on a ship? Is it the paddle guard on the Waverly? howlsatthemoon wrote: Is it the paddle guard on the Waverly? It is.. First time i've seen the steamer that close up for years.. Was docked at the waterfront in Greenock at lunchtime today, then it headed doon the water to wherever it was going. No a soul on it either. Who was steering it then? A Horse called Juan Face wrote: Who was steering it then? Brings back memories - I worked on the Waverley many years ago. In the middle of winter fitting new paddles - red wood imported from America - we had to use extra large spanners attached to ropes - as we worked above the surface of the water. We spotted the body of a boy who had gone missing Two weeks before. We had to pull what was left of the bloated corpse out of the water - Well my mates pulled him out - me I was too much of a coward. This is my carlsberg photo, probably the best picture I have ever taken with a mobile phone. 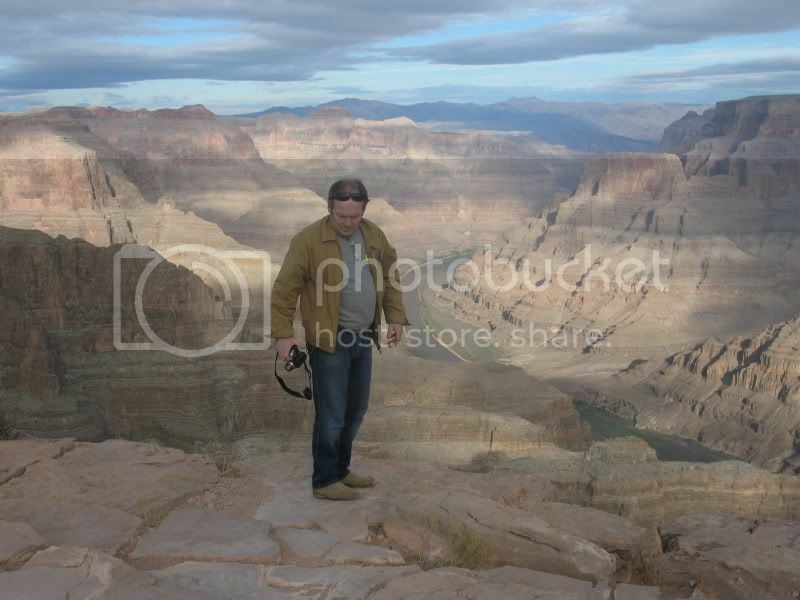 John standing right on the edge of the Grand Canyon.